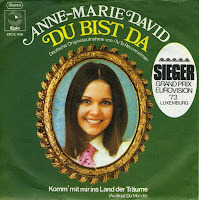 I already wrote about Anne Marie David's 1973 winning Eurovision song Tu te reconnaitras (and the German version Du bist da and the English version Wonderful dream) on this blog, but there's more to this lady. She represented Luxembourg in 1973, but returned to Eurovision in 1979, representing her native France with the song 'Je suis l'Enfant-soleil'. This year, I've been able to buy 'Tu te reconnaitras' and the German version of that song, 'Du bist da'. 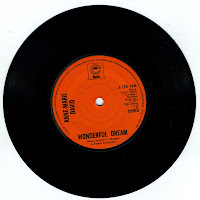 Somehow it was just a question of time that I would bump into the English version, 'Wonderful dream'. Interesting fact: the A-side of this single is in stereo, the B-side is only in mono. Anne Marie David was one of the few Eurovision winners that charted in the UK singles chart with a translated version of their song. The single peaked at number 19, which is pretty good in England for a non-UK entry. I'm still looking for a disc with a picture sleeve if it exists, but for now this will do. Anne Marie David won the 1973 Eurovision Song Contest with 'Tu te reconnaitras'. I didn't know at first that she'd released different versions of the song. 'Du bist da' was recorded for German-speaking countries. Even the B-side 'Au bout du monde' was translated into German for this single. 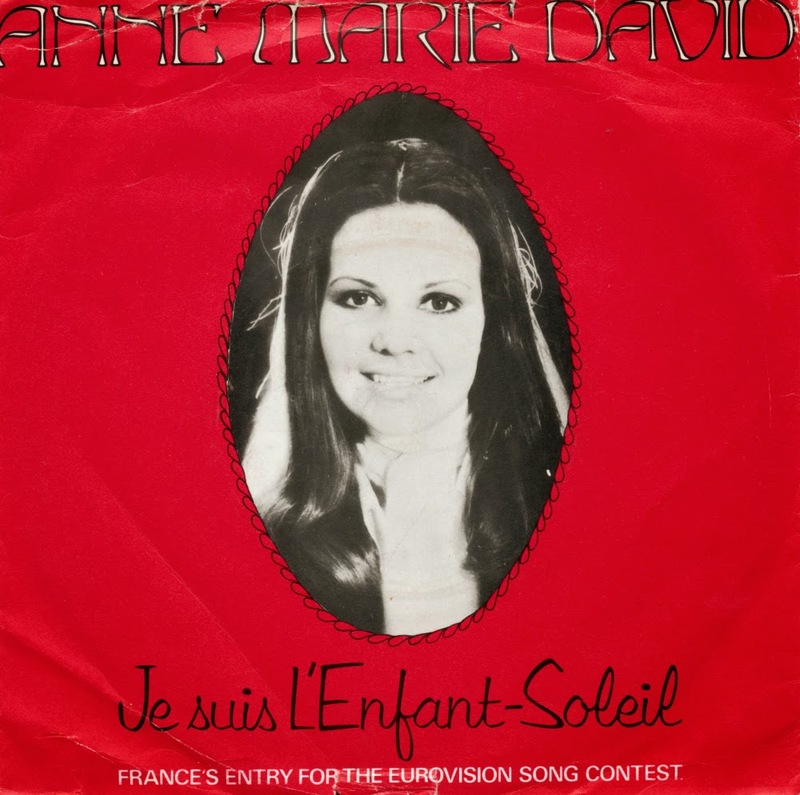 After the Contest, Anne Marie David started touring the world. She lived in Turkey for a while and recorded two singles and one album in Turkey and got several awards there. Anne Marie David was born on May 23, 1952 in Arles, France. She moved to Paris when she was eighteen to get involved in musical theatre. In 1972, she was cast in the role of Mary Magdalene in the French version of 'Jesus Christ superstar'. A year later, she was selected to represent the country Luxembourg with the song 'Tu te reconnaitras'. The 1973 edition of the Contest was a threeway battle between three legendary songs: 'Power to all our friends' by Cliff Richard (representing the UK), 'Eres tu' by Mocedades (representing Spain) and Anne Marie David's song, which was the one that won the Contest in the end. Anne Marie David secured a second successive triumph for Luxembourg. The single was bought for me by Puck, helping me to complete my collection of winning Eurovision Song Contest songs.